Following -- what else? 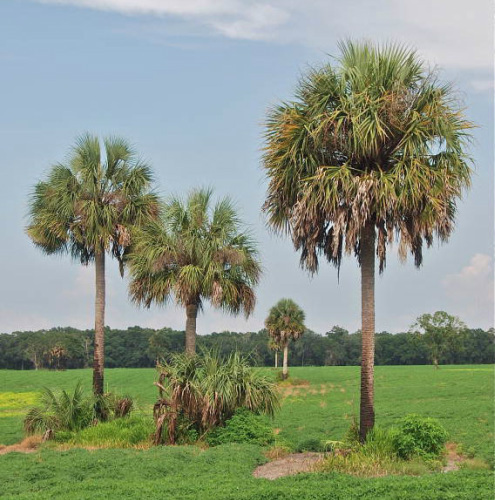 -- a years-long debate, the Florida legislature designated the sabal palmetto palm as the official state tree. According to the St. Petersburg Times, the sabal palm's backers had to fight for several sessions before getting their way. Opponents included the state forester, C.H. Coulter, who favored the slash pine. But when the Florida Federation of Garden Clubs endorsed the sabal palmetto, even Coulter bowed to the inevitable and had nothing but good to say about the hardy native tree. Indiginous to the southeastern U.S., Cuba and the Bahamas, Sabal is a fan palm that can grow up to 20 meters in height. It has served people in a multitude of ways for thousands of years. Travelers know they are close to the Atlantic Ocean coast when they begin to see the sabal palm rising out of the distance. The heart from which new fronds grow can be used as a food -- the key ingredient in "heart of palm salad" -- and was commonly eaten by Native Americans. Native Americans also constructed housing out of the cold-hardy tree's leaves and trunks, creating a structure known in the Mikasuki language as a "chikee." Its leaves are used for thatched roofs, hats, baskets, pocketbooks and in church on Palm Sunday. They can be used in brooms and whisk brushes, and can even be stitched into table tops. Its trunk can be used to make wharf pilings, log cabins and cordoroy roads across wet swamps. And of course, the heavy palms provide sanctuary for Florida's native and migratory songbirds, woodpeckers, butterflies, squirrels and other wildlife. In 1970, the legislature voted to replace the cocoa palm with the sabal palmetto on the state seal.